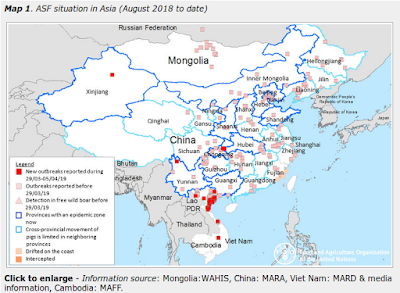 Since early March of this year, getting timely official notifications of H7N9 cases out of China has been . . . well, challenging. Some provinces still occasionally post notifications on the MOH sites, but all too often we only get official notice in a footnote in their EOM epidemiological reports or from a WHO summary after the fact. Local media still reports on some of these cases, and (for the most part) are fairly reliable, but details are usually scant. Sometimes, though, it’s all we have. Last night Sharon Sanders of FluTrackers picked up a Chinese Language report of a suspected H7N9 case in Meizhou, Guangdong province, with confirmatory tests pending. Today, numerous Chinese media outlets are reporting this as a `confirmed case’. Hong Kong, lying immediately adjacent to Guangdong Province, is usually quick to react to any cases in their neighboring province, but has yet to post anything on their site. That said, the timing for starting to see fresh cases of H7N9 is right. So, file this under `Maybe’. Yangcheng Evening News? Reporter Huang Zhou Hui, Wei correspondent Guangdong letter? Report: 23, the reporter learned from Meizhou City, since the first case of H7N9 flu this winter appeared in the region. That night, reporters from the Guangdong Provincial Development Planning Commission Wei confirmed that the case has been confirmed.